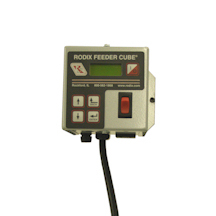 FC-200 Series - Vibratory Feeder Controls - Rodix, Inc.
Rodix Inc. is your leading source for innovative vibratory feeder controls. From the basic FC-70 Series amplitude control to the cutting edge Auto Tune® Series of variable frequency controls, each family of controls is engineered and manufactured to be as robust as possible and to meet your specific vibratory feeding requirements. 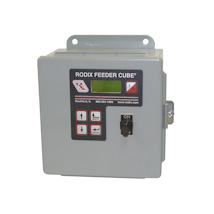 Rodix Feeder Cubes assembled in general purpose enclosures are designed for environments that are free from liquids and contaminants. 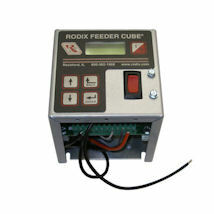 Open frame or chassis mount controllers are designed for integrating a Rodix Feeder Cube into a larger control enclosure. Rodix Feeder Cubes assembled in Nema-12 oil resistant enclosures are designed for environments where cutting oils, coolants, metal flake and other contaminates are present. The power on/off switch and the main control potentiometer are sealed and the gasket on the inside of the enclosure cover helps to keep pollutants out.